By the time all the digital media is collected and made available, I suspect the Sendai Quake of 2011 may be the most filmed and photographed natural disaster to date. There is an air of unreality about many of the images (moving or still) that have come out so far, particularly since a real tsunami — as opposed to Hollywood’s version — is far more like a sloshing or overflowing bathtub than like a gigantic wave. But what becomes clear, particularly from the video footage, is just how powerful, how inexorable, that surge of water is, even when it doesn’t appear to be moving terribly fast. Here, with a hat tip to Ann Althouse, are perfectly oriented and aligned overhead photographs of selected areas of Japan before and after the tsunamis. To get the full effect, drag the slider in the middle of each picture all the way to the right — showing the full ‘before’ photo — then drag it slowly over to the left — showing the full ‘after’ photo. [NOTE: based on comments over at Althouse, the slider doesn’t appear to appear under IE.] What I find most telling are the areas where standing water is left behind. I don’t know if that’s because the area is below sea level, or because there’s higher ground between those areas and the sea, or for some other reason. But it makes clear just how staggering difficult the cleanup and reconstruction will be. 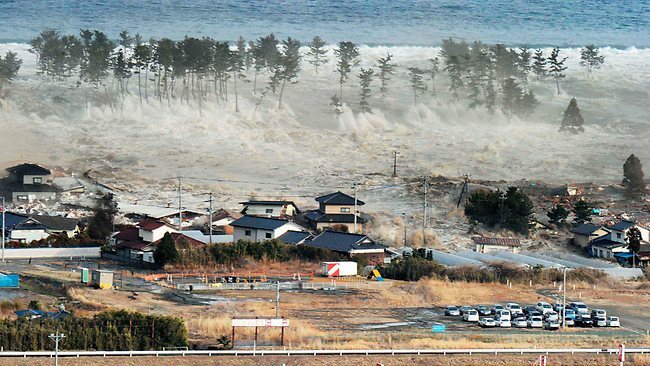 And here, with a hat tip to Rand Simberg at Transterrestrial Musings, is new video showing the initial tsunami surge in Miyako and Kamaishi. You get a real sense of how much energy is contained in the deceptively quiet surge, particularly as you see the large fishing boat smashed and torn apart on the underside of the elevated highway (as cars are driving on it!). If I find more new footage (beyond that which has been showing constantly on news channels and shows), I”ll post it here. ..bruce w..